Pete De Luca was born in Knobview (Rosati), Missouri on December 8, 1916 to parents who emigrated from Italy in the early 1900s. His father, Peter, came first as was usual in those days. He worked until he had earned enough money, and sent for his wife, Matilda and oldest child, Mary. The family went first to St. Louis but soon settled on a farm in Knobview, where they raised concord grapes, primarily and other crops to support their growing family. Pete and his sisters, Elizabeth, Rose, Aileen, and Ann, were all born there. Another boy, Julius, died as a young man. Pete attended the local school where he met Ernestine Hartman, a friend of his sister, Aileen. They were married in 1937 and moved to St. Louis. The Depression was still a very real thing and Pete worked at a variety of jobs including truck driving, hauling produce and coal. Pete and Ernestine's first child, Elizabeth, was born in 1938. In 1940, the family moved to Coldwater, Michigan where Pete had secured work with the L.A. Darling Company, a manufacturer. His son, Peter, was born there. After the beginning of WWII, Pete went to work for a short time at Firestone's defense plant in Akron, Ohio, leaving his family in Coldwater. In 1943, Pete made the move to California, where he initially worked in a defense plant. It was at this time that he became interested in starting his own business. With the little money he had saved, he went into partnership in a display business with Joe Seidman. The display business included the manufacture of mannequins, display set­ups for department stores, and the decorating and manufacturing of display materials. The original shop was in downtown Los Angeles. Pete continued to work at the defense plant, moonlighting another full day at the display business. He sent for his family, and a short time after their arrival in California, they moved into a loft apartment over the shop. Since the war had made housing impossible to find, the display work took Pete around the country, expanding his business contacts and know-how. Work was done for the May Company in Los Angeles (displays and mannequins), the Sahara Hotel in Los Vegas (decorating the original casino), the city of San Diego (a huge, ice mountain for a Christmas display), and a litany of others. They continued to live in the loft apartment several more months, and in September, 1944, they purchased a home in Los Angeles. Their daughter, Leslie, was born there in 1949. In 1953, Pete moved his business (now the P.L. De Luca Company) to new quarters on Jefferson Blvd. in the Belwin Hills area of Los Angeles. It was there that he became involved with the molded-fibre die dry process which culminated in the establishment and building of Western Molded Fibre in Gardena, California. The company was built primarily for the manufacture of molded fibre fairings for airborne rocket launchers. The molded fiber material was ideal for high speed wind resistance while remaining easily frangible for rocket penetration. The frangible fairing, one of Pete's designs, is still in use today. Western Molded also made molded fibre tow targets, tote boxes and corn boxes, while continuing to manufacture mannequins and other display material. In 1960, Western Molded Fibre merged with Hawley Products Company of St. Charles, Illinois, the largest manufacturer of molded fiber products in the United States. This company manufactured all of the very high quality speaker cones for sound reproduction at that time. They also produced the shells for American Tourister Luggage, many automobile heater system components, and a variety of other items made by the molded fiber process. Pete became Vice-President of this company while still holding the reigns at Western Molded. While with that company, he established their introduction into the military field by rejuvenating a 20MM ammunition separator and designing a molded fiber pallet for transportation and air drop of material. At Western Molded Fibre, he developed the production of cork plugs for the five inch 54 and 38 naval rounds, a product entirely new to himself. It was during this period that Pete became interested in the development of the combustible cartridge case. Some work in the area had been done by the government and Armour Research Institute, but a feasible economic method of production had not yet been developed. Using the Western Molded Fibre facilities, Pete developed tooling and procedures (with some patents under his name) to manufacture the 152MM combustible case and its associated case, the XM194 Shillelage case. It is interesting to note that stub base 90MM and 105MM cases, both live and inerts, were also experimented with at that time. Pete left Hawley Products Company in 1967 and joined with a partner, Norman Dreyfuss, the president of E.F.M.C. Corporation in Compton, California, a manufacturer of fiberglass gun shields and associated products. The two men established E.F.M.C. Technical Systems, a new plant which was built in Coachella, California to manufacture cartridge cases. The plant was built with private money and faith built on Pete's known ability, knowledge and contacts in the field. The plant was built on a barren, plowed-under, cotton field. Ground was broken in February 1968, with parts being produced by July of that year. A small production contract was awarded, and the first article was presented in October. Pete had designed the entire plant from scratch, based on his growing knowledge of the combustible materials. The plant was laid out to conform with government quality distance requirements and all other safety aspects of manufacture known at the time. Nearly all the personnel initially employed were local people, some of whom helped in the construction of the facility. The technical staff was minimal, consisting of Pete and two others who had worked for him at Western Molded Fibre. A chemist, quality control manager and production manager were later hired. The original l52MM case was a post-impregnated and re-struck product, identical to the case being produced at that time by Western Molded Fiber. The case had inherent problems in manufacture and in use as an end product. As a result, the arsenal which had instigated initial trials awarded a contract to E..F.M.C. for the production of the XM157E1 case. This case and the processes developed for its evolved configuration, the M20S, was the basis for the development of the igniter tubes, mortar increments and many R&D products . In 1970 E.F.M.C. merged with Heath Techna, a diversified corporation headquartered in Kent, Washington. This Corporation is now Criton Corporation. Pete remained with the company as President and Director of Manufacturing, despite trying to retire on several occasions to his many other pursuits. Throughout his years at Molded Fibre, he maintained many other interests. He owned and ran a silver mine in Mexico, owned and ran a major Southern California Machine Tool Supply Company, owned an interest in an aircraft manufacturing company, became a licensed pilot, and consulted in engineering and business around the world, traveling extensively to do so. 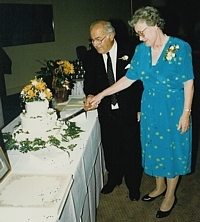 Pete and Ernestine are seen here at their 50th wedding anniversary in 1987. 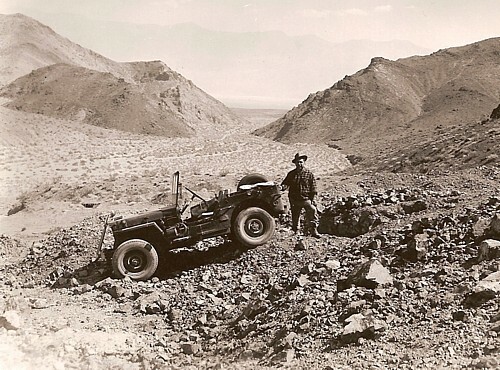 This is Pete in Death Valley where he mined uranium.